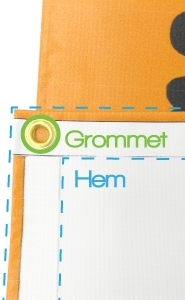 Banners.com: What are hems and grommets? Hems consist of one inch of the vinyl banner material folded over to the backside of the banner and heated together to form a clean and strong one-inch hem. The hems increase the strength and durability of the banner. Other finishing options for vinyl banners include 2" pole pockets, 3" pole pockets, reinforced hems and reinforced corners. Click here to get started on your banner.